The sun shone in King’s Lynn yesterday (June 11) as churches of different denominations came together to stage a free fun day in the park, blessing hundreds of people from the local community with live music, inflatable slides, a vast selection of complementary cakes, circus skills and much more, reports Jenny Seal. The inaugural Celebrate in King’s Lynn took place on Saturday, June 11 in The Walks, a beautiful park in the heart of the town. Many of the churches and Christian organisations of King’s Lynn had come together to stage a free community fun day and as their stalls opened at 10am the rain stopped and the sun began to shine. With a backdrop of live music from local bands as well as bungee runs, sumo wrestling, facepainting, penalty shootouts, bouncy castles, volleyball and displays from King’s Lynn American Football Club there was always something to keep the hundreds of visitors and passing families entertained. At the refreshments tent visitors could choose from a huge range of homemade cakes as well as tea, coffee and squash all completely free. Each church came with a different activity, each with the intention of blessing the town’s community. Reffley Community Church of the Nazarene were out in force hosting a coconut shy, a tin can alley, facepainting and a ball throw stall. June Mitchell MBE (pictured right) had collated a commemorative display for the Queen’s birthday complete with the medal and documentation from her own MBE award. King’s Lynn Baptist Church teamed up with clown Sally Crazy Bananas (pictured right) to offer a circus skills area, along with balloon modelling, giant bubble blowing and facepainting. Tina and Emma from Terrington St Clement Parish Church (pictured below right) spent the day blessing people with a free hand and arm massage. King’s Lynn Christian Fellowship ran a mini Olympics for teams of two, encouraging families to work together to complete a series of fun challenges. Assistant Pastor Darryl Mallet said: “It’s great that we are connecting with the community. So often we expect people to come in but here we are out. The fact that it’s all free and just about God blessing people is important. And it’s great to work with other churches”. St Faith’s Church, Gaywood had a display of prayer shawls as well as giant jenga, hook a duck and throwing ping pong balls in a bowl. Messy Church craft activities were available to do at the St John the Evangelist Church stall and The King’s Glory Centre had a mountain of beads for people to make jewellery, key rings or other mementos. The Gateway Church had brought their fully kitted out camper van (pictured right) as an attractive talking point and the Christian Motorcycle Association displayed their bikes. There were also stalls promoting the work of the King’s Lynn Foodbank, King’s Lynn CAP Debt Centre, the Salvation Army and the College of West Anglia. Alison Hill, the Coordinator of Celebrate in King’s Lynn (pictured right with Lulu), had always stated that the aim of the event was to bless the people of King’s Lynn and to give the opportunity for churches to showcase their projects and ministries. 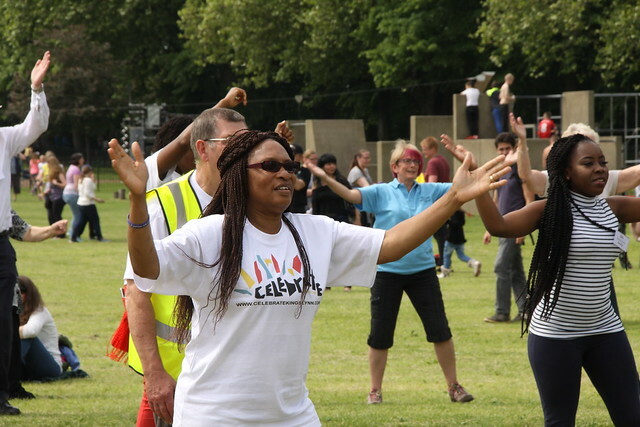 The Celebrate team, the local churches and their volunteers worked hard to put on a fun day that successfully fulfilled that aim. Read a story about Celebrate Norwich & Norfolk.